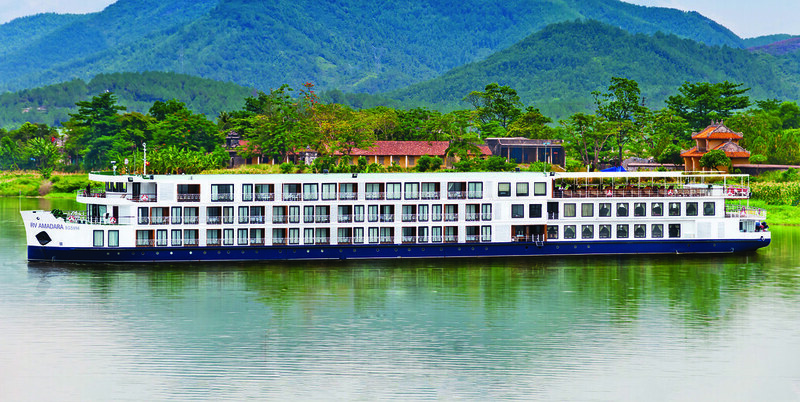 Award-winning luxury travel operator APT today announced the expansion of its Asia river cruise fleet with the inaugural sailing of the new 124-passenger RV AmaDara along the Mekong River. Welcoming the new rivership, APT Chief Marketing Officer Debra Fox said, "We are delighted to announce the addition of our latest ship, the AmaDara, to our fleet. Like our other Asian river cruise vessels, we've combined comfort and luxury with authentic local design and outstanding immersive sightseeing to ensure guests experience the very best of the region, both on and off the ship." Joining sister ship the RV AmaLotus, the AmaDara features an innovative design, boasting 62 extra-spacious staterooms and luxury suites, as well as a new specialty restaurant. Each well-appointed stateroom includes a private 'Twin Balcony' comprising a French Balcony with a second full-sized step-out balcony. The ship's interior is reflective of elegant French colonial décor, while inspired by Southeast Asia with authentic Mekong artifacts and accents. Guests sailing aboard AmaDara will enjoy an array of comfortable amenities including air-conditioning, Wi-Fi, a spa, a fitness centre and a refreshing sun deck with swimming pool. The all inclusive lifestyle available to guests travelling on APT's Vietnam and Cambodia holidays also extends to the AmaDara. As well as a special Vietnamese welcome dinner designed by APT Asia Ambassador, celebrity chef Luke Nguyen, guests sailing on APT itineraries will enjoy inclusions such as all meals and beverages onboard, all flights within Asia, five star luxurious accommodation, an APT cruise or tour director, all sightseeing, transfers, airport taxes, port charges and tipping. Travel agents can book clients to travel aboard the AmaDara as part of APT's 12-day Vietnam and Cambodia Highlights. Priced from just $4,395 per person, twin share, the trip commences with a two night stay at the five-star Sheraton Saigon Hotel and Towers in Ho Chi Minh City, from where guests can choose to learn about the battle of the Long Tan or visit the Cu Chi Tunnels before enjoying a special degustation dinner designed by celebrity chef Luke Nguyen, complete with matching wines, at Xu Restaurant. The journey also includes a seven night lower Mekong cruise to Siem Reap aboard the AmaDara. Highlights include a visit to Evergreen Island, a rickshaw ride around Tan Chau, a Buddhist blessing at the monastery in Oudong, and an ox-cart ride through rural villages. The trip concludes with a two night stay at the Hotel Sofitel Angkor in Siem Reap from where guests can experience a 'Champagne sunrise' at the World Heritage-listed Angkor Archaeological and enjoy a special farewell dinner with traditional Apsara dance performance. To find out more about APT's luxury tours and cruises to Vietnam and Cambodia, please call APT on 1300 196 420, visit www.aptouring.com.au or see your local travel agent.